The challenge, as with so many ‘contemporary’ garden features, is to design a water feature that looks original, has clean lines, works, and is easy to maintain! Water, such a desirable element, can be unpredictable, particularly when designing a new concept, or employing a familiar construction method but in an exposed environment, such as a roof garden or a roof terrace. Even simple concepts can be hard to achieve, ticking all the boxes; so designing water features is not for the faint-hearted! What about this contemporary Waterwall? 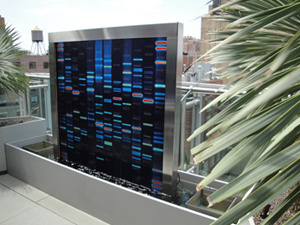 Conceived for a penthouse roof terrace in New York City for clients that wanted a ‘unique waterfeature’. 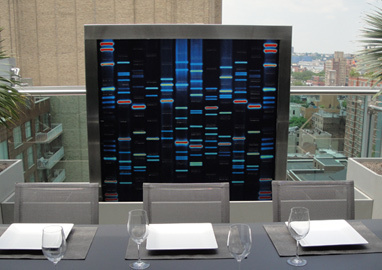 What could be more unique than DNA? 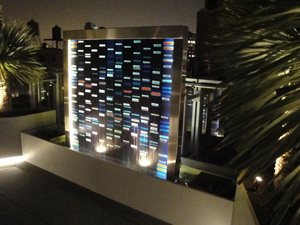 Two translucent, colour enhanced, photo images of their DNA were merged to create a this stunning Waterwall. Many technical challenges were overcome, not least the logistics of being thousands of miles away during the installation!